Ron Samascott with his local apples at the Union Square Greenmarket in New York. The city is teaming up with Wholesome Wave, hospitals and farm markets to pilot a fruit and vegetable prescription program. It was the Greeks who first counseled to let food be thy medicine. And, it seems, some doctors are taking this age-old advice to heart. 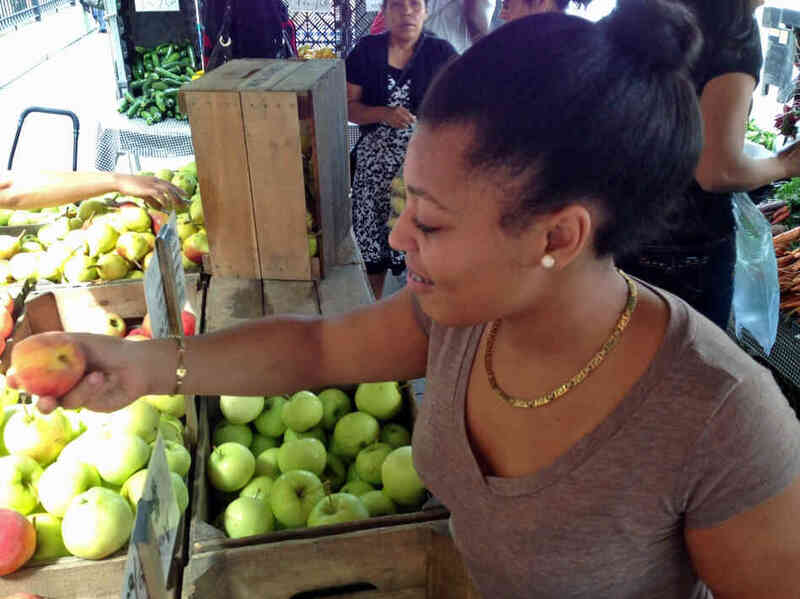 In New York City physicians are writing prescriptions for fresh fruits and vegetables. That's right, 'scripts for produce. If you listen to my story on All Things Considered, you'll hear that the program is the creation of Wholesome Wave, a nonprofit that connects low-income people with local produce. It's led by chef Michel Nischan, who was motivated to make healthful food more accessible after his two sons were diagnosed with juvenile diabetes. After learning that the Type 2 diabetes can be controlled or even reversed by good nutrition and exercise, he's made this his life's commitment. On a recent Tuesday I met up with Nischan in New York, where we checked in on the Rx Fruit and Vegetable program. Nischan told me he has pursued this partnership with doctors because so many people rely on their trusted advice. When docs write prescriptions for drugs, people fill them. So why not prescribe healthful food? Basically, the initiative is designed to nudge the families of overweight kids and teens to change the way they eat. And the big incentive? Free produce as well as tips on how best to cook and economize. Johanna Terron, 14, has lost over 20 pounds over the past year. She receives a prescription for fruits and vegetables from her pediatrician at Lincoln Hospital. Kids enrolled in the program at Lincoln Medical and Mental Health Center in the Bronx meet with a doctor or nutritionist once a week. During the appointment, doctors measure their blood pressure, insulin levels and weight. At the end of the appointment they leave with a prescription that can be swapped for Health Bucks accepted at 140 farm markets in the city. Participants receive $1 per day for each person in their family. So a family of four get $28 of free produce a week. "It's a little unusual," says Lincoln Hospital pediatrician Katherine Szema, because doctors are accustomed to writing prescriptions for drugs. I met up with Szema and one of her patients, 14-year-old Johanna Terron, at the farm market just outside the hospital. Terron has been struggling with a weight problem and serious asthma. "I'll be honest with you," Terron says. "I never touched vegetables." She says she used to hit Burger King almost every day and ate lots of junk, "like chips, candy, soda, ice cream." She'd never eaten a pear or cantaloupe, she said. But over the past year, she's swapped greasy fries for peppery radishes and greens. And she says she's pretty certain her taste buds are changing. "I don't know how to explain it, but [the fresh food] tastes better." Szema says she's lost more than 20 pounds and her asthma's much better. "She's healthier. She doesn't have to use her rescue pump as much," Szema says. And it's easier for her to exercise, now that her weight is down. Szema says the simple act of prescribing fruits and vegetables doesn't change anything overnight. It's just the first step of a long process to slim down. But, she says, she's impressed by what a powerful nudge it can be. She's no longer just telling her patients to eat healthfully — she is actually helping them do it by making it affordable and accessible. "You're coaching [your patients] to put what's healthy in their body," Szema says. And in Johanna's case, the people around her are eating better, too. "The whole family is making changes" Szema says. For Wholesome Wave's Nischan, who spent years imagining how such a program could work, the results are satisfying. There are now two years of data from pilots showing that many people who participate actually lose weight. "The first year 38.1 percent [of the participants] dropped their body mass indexes," Nischan told me. And in the second year it was 39 percent of the participants. "So it's working; we're excited about it." And he says he's looking forward to expanding it. "We have interest from all over the country," Nischan says, and smiles.